Link Exchange Program. This is a family-friendly site and we reserve the right to refuse the submission of any website, regardless of content. Thank you for your interest in a possible link swap with us at Total German Shepherd.com. We're very interested in partnering with quality, dog related websites. While we do accept links from quality dog related organizational websites, such as rescue organizations and the like, we do not accept link exchanges from individual dog breeder websites at this time. by clicking here. All submitted sites will be reviewed for suitable content. We will only consider English language, primary domain or TLD sites for approval. Any site with casino content, cigarette sales, provocative content or adult products or sites "under construction" will not be considered. • As the initiator of the request, you must FIRST post the reciprocal link (see below) to Total German Shepherd on your website before asking us to include yours. • You may link to us from any page of your site as long as it is within two clicks of your home page. • If you are adding our site to a links page on your site, there must be a link from the home page of your site to the 'reciprocal links' page of your site. • We will add your link to our site on our links page as long as our content is similar and we have similiar Alexa and Google rankings. • Your placement of our reciprocal link will be considered a deciding factor for acceptance or denial. • Our links are continually monitored and if we find that our Total German Shepherd reciprocal link has been removed from an exchange partner's website at a later date without courtesy of notification, we will remove their reciprocal link from our site as well. 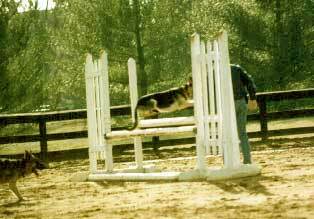 Description: Visit the ultimate resource for German Shepherd information. GSD Breed information, training tips, pictures, German Shepherd health and nutrition articles, a German Shepherd Dog breed newsletter and blog, dog trivia, German Shepherd facts and much more.